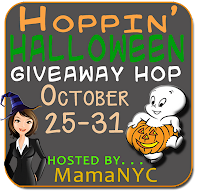 Welcome to the Hoppin’ Halloween Giveaway Hop hosted by MamaNYC! We’re celebrating Halloween with an amazing event that features ALL sorts of prizes, which means there is going to be plenty of prizes you’ll want to try and WIN! 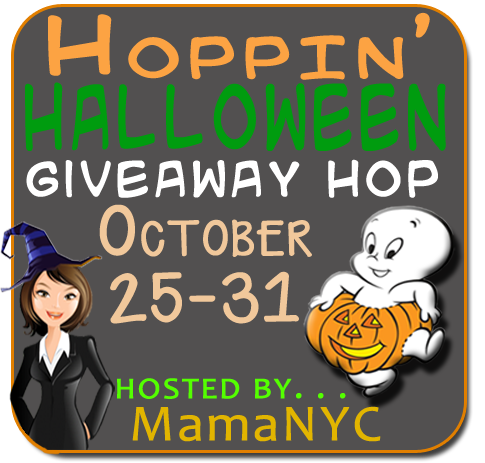 With over 90 blogs participating, Hoppin’ Halloween is surely going to be a SCREAM! This event will run from October 25-31st which gives you plenty of time to enter all of our giveaways. Good luck and Happy Halloween! Once you have entered be sure to check out all the other great prizes available to be won on the Linky List below. I found this recipe years before I had internet so I have no link. The recipe, Socca, is from France although it uses middle eastern besan, chickpea flour. For a year or so, it was part of my Sunday brunch menu. Whisk besan into water; whisk in vegetables. Let stand, covered, 1 hour. Coat 12" pizza pan with 1 T oil. Stir batter; pour into pan. Drizzle with 1 T oil. Bake at 450F for 20 minutes until golden and crisp. Obviously not something you can cook year round but whenever I find Swiss chard I make this. My 8 year old wanted to try a science experiment in our kitchen. Does using juice instead of water change a cake? YEP! It makes it yummier!! Preheat oven per directions on box. Follow the steps the box specifies, but substitute the can of pineapple juice + the 2 ounces of water for the 1 cup of water the box calls for. (If you’re experienced enough, reserve the juices from the crushed pineapple can and add 2 ounces of that instead of 2 ounces of water.) Bake cake as directed for 2 circle pans. Remove from pans and cool on wire rack. Once completely cool, lay first layer on a plate and top with crushed pineapple. Turn the second layer upside down and put a thin layer of frosting on the bottom of it. Place it on top of the first layer, with the frosting touching the pineapple. Frost with remaining frosting. Serve as you wish.